In recent years, Loughlin’s cartoonish, hyper-masculine, smoking “brute” has been featured in The New York Times, Apartment Therapy, Design Boom, etc. 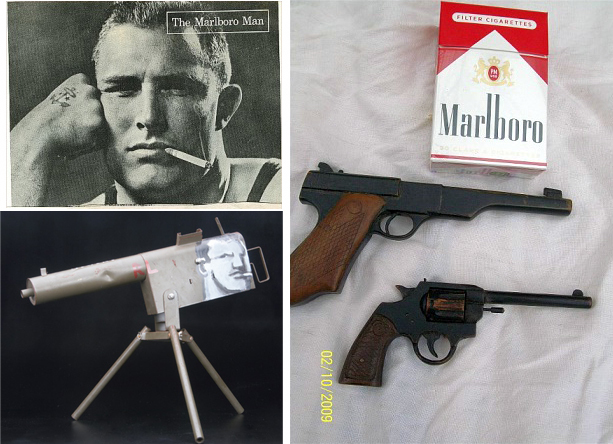 While most cite partner, Gary Carlson and his muse and inspiration for “the brute” motif, another important influence may be Leo Burnett’s “Marlboro Man” as the magazine clipping below (from Loughlin’s photo web site) seems to suggest. Filters at the time were described by Leo Burnett as “sissy”. Real men didn’t smoke filter tipped cigarettes. 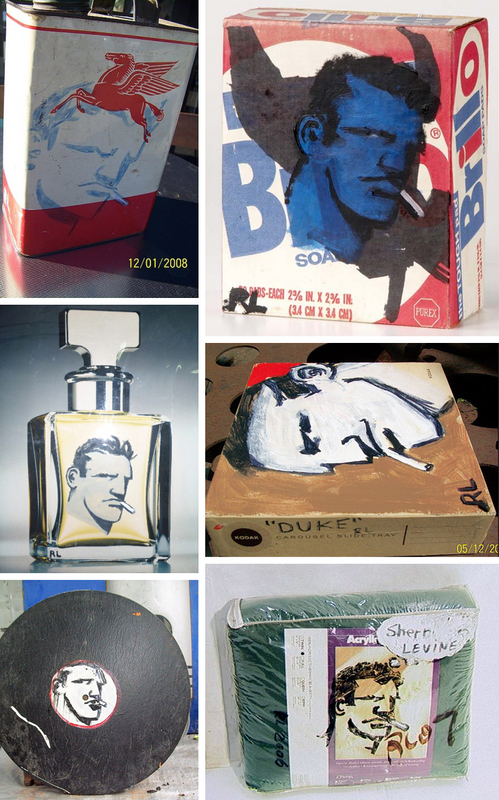 … Marlboro sold masculinity in 1954 by being the first brand to use “real men” versus the prior models. And what men! They showed football players, cowboys, airplane pilots, and sailors. These were tough, real men… The ads were not just masculine, but were single-mindedly masculine They portrayed manly, rugged men doing manly, rugged jobs. (What is the deal with the guns and the Marlboro pack above? Are the guns little? 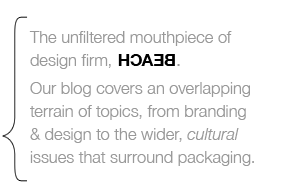 Or is it an oversized cigarette pack? I don’t know.) The machine gun on the left, is a vintage Tru-matic brand toy machine gun, painted and signed by the artist. 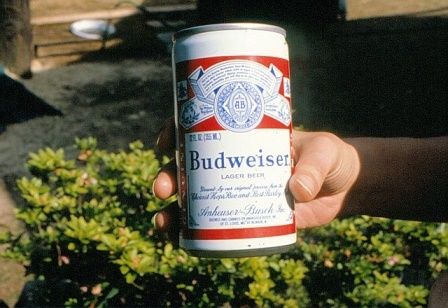 Photo of the hand holding the Budweiser can is from Loughlin’s photo web site, and while I wouldn’t be surprised to learn that he’s subjected some beer cans (and cigarette packs) to his “brutish” rebranding —looking online, I can find no examples of that. 1. Full disclosure: I know (or used to know?) Robert Loughlin & Gary Carlson, personally. In the early 1980s they had an East Village gallery called “The Executive Gallery” and gallery director, Arch Connelly invited Debby —(BEACH partner, Debby Davis)— to have her first one man show there.